For Valentine’s Day, my husband took me out for a great day trip that combined two of my favorite things, nature and textiles — first we went birding for a couple of hours; then we went to a cotton gin museum. We went to Lake Somerville State Park. It is just about an hour west of where we live, but we saw some very different birds from those at home. and I got the best Yellow-rumped Warbler picture I have ever gotten in my life. Finally! A cooperative Yellow-rumped Warbler allows me a clear photo. But the most interesting thing was a big flock of birds that just kept moving. I thought they were Common Grackles, because we have those move through here. But when I looked at the pictures, I figured out that they were mostly Red-winged Blackbird females. I had a sort of vague memory that some birds migrate in waves, with the males going first to stake out territories and get them ready for the females, so I looked it up, and indeed that is what Red-winged Blackbirds do. As a result of his studies at Ithaca in 1911 and 1910, he [Arthur A. Allen] divides the migratory waves into seven classes as follows: “Vagrants” arrived from February 25 to March 4; migrant adult males from March 13 to April 21; resident adult males from March 25 to April 10; migrant females and immature males from March 29 to April 24; resident adult females from April 10 to May 1; resident immature males from May 6 to June 1 (1910); and resident immature females from May 10 to June 11 (1910). Studying the pictures more closely, I couldn’t find any Red-winged Blackbird males at all, but for about every 15 blackbird females, there was a Brown-headed Cowbird male. But just one Brown-headed Cowbird female for every 50 blackbird females! Part of a photo where I marked each bird with a red dot to count. 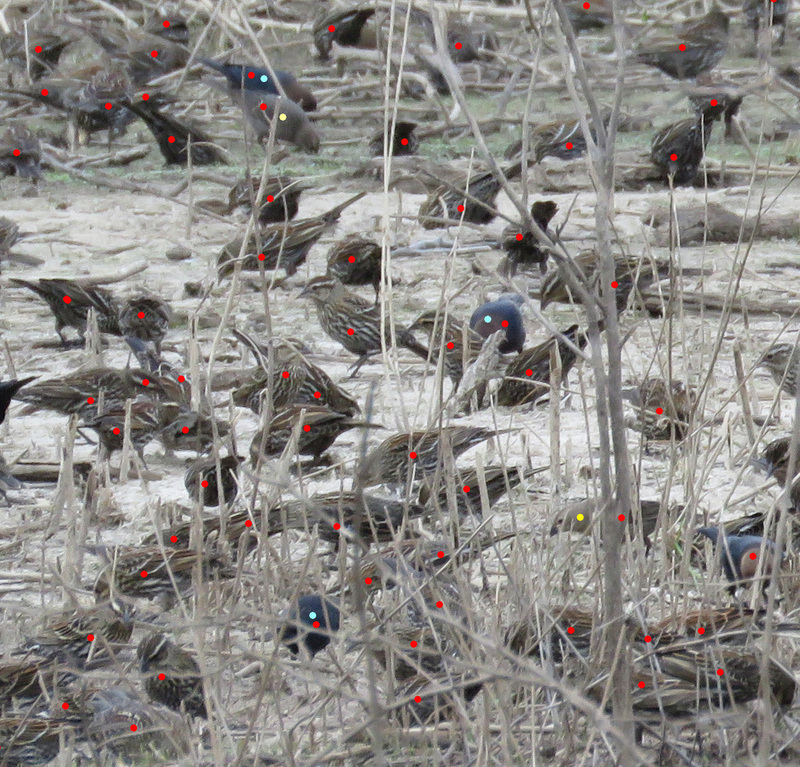 The streaky birds marked with only a red dot are Red-winged Blackbird females. The blue dots are for Brown-headed Cowbird males and the yellow dots for Brown-headed Cowbird females. According to several sources, including this one, Red-winged Blackbirds are often seen in mixed flocks, with cowbirds, grackles, and other blackbirds. So I understand that part, but I am curious as to why there are so few cowbird females in the mix. 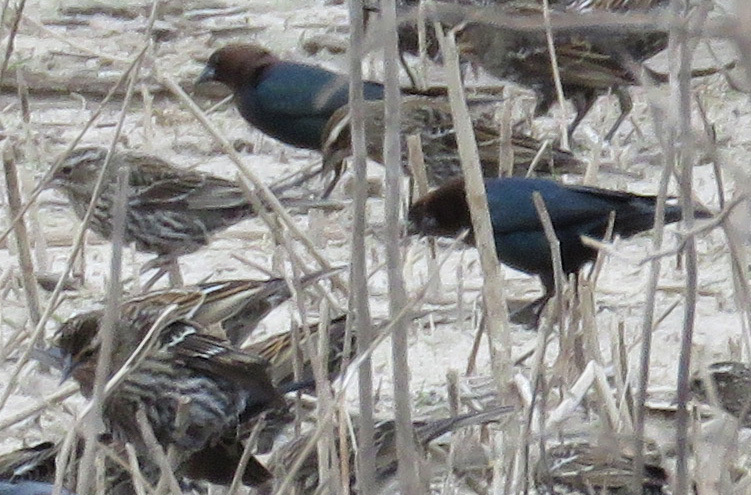 The Brown-headed Cowbird males are easily identifiable in the mixed flock. 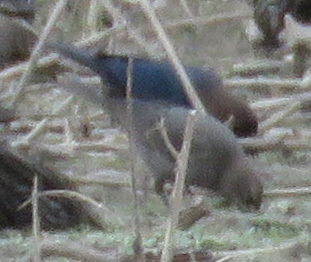 Brown-headed Cowbird pair. The female is nondescript, but her smooth solid coloring is easy to differentiate from the streaked blackbird females. If there were more present, I think I would be able to find them. Brown-headed Cowbirds are known for brood parasitism. The females move in on another species’ nest, lay their eggs, and leave. The other species raises the cowbird baby, often at the detriment of their own young. The cowbirds don’t depend on just one species; according to Kent Rylander in The Behavior of Texas Birds, 140 different species are known to have raised cowbird babies. So what is going on here? Are the cowbird females off laying eggs in other nests? Hmmm? I have no idea. Like I said, I don’t have these birds at home so I am not that familiar with them. I have seen a pair of cowbirds here on two occasions, but I have never seen Red-winged Blackbirds here. If you have an explanation, I would love to hear it! 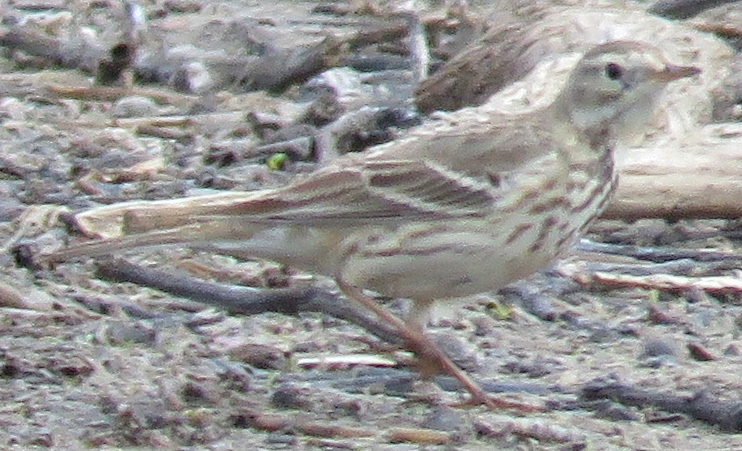 The other thing that was special is that I got a life bird, American Pipit! Now, my life list is not extensive, it is more like some people’s month list. Or even a list for a good weekend. I am at 178 birds, I think, but I am always happy to get a new one. This bird is a good example of looking carefully at every bird you can — I almost dismissed it as a Chipping Sparrow, but it was wandering around on the mud flats next to the lake where I wouldn’t think a sparrow would be, so I took some pictures just in case it was a new bird to me. Being that this is the weekend of the Great Backyard Bird Count, I entered my sightings on eBird. 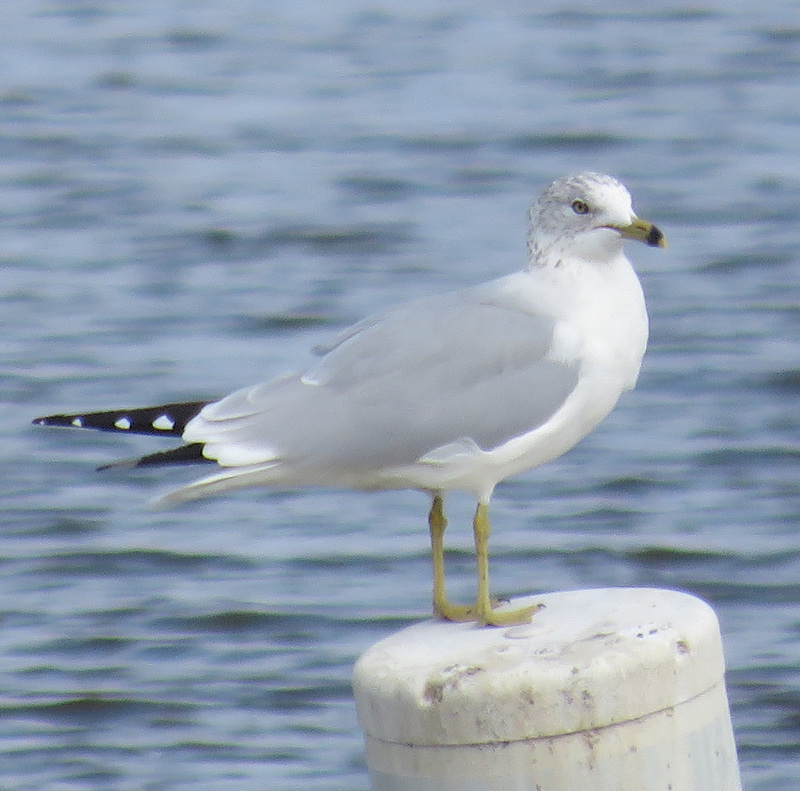 In my home county, there have been 73 species sighted and 65 checklists entered, but for the county Lake Somerville is in, there have only been 33 species and 5 checklists entered, so I am glad I helped add to the statistics there. 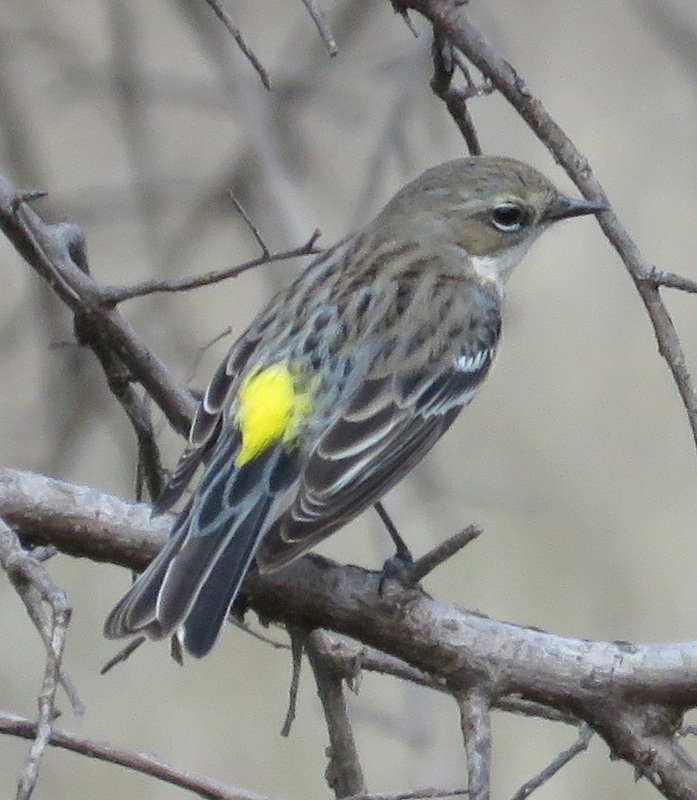 I love the Yellow-rumped warbler! My friend who lives about 30 miles north of us had a large flock of male red-winged blackbirds on her property recently, but I’ve never seen one here in Georgia. We saw many when we lived in Indiana. 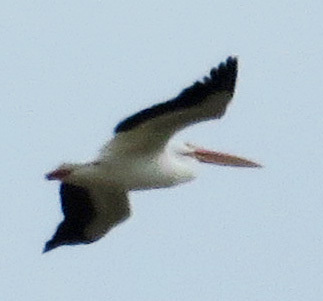 I am amazed by pelicans in Iowa! I have seen bald eagles in Alaska and Wyoming, but not here. Although they are around, and two times lately I have seen a large dark bird with white head and tail fly over – but it didn’t seem particularly hawk-like. I will keep my eyes peeled! What a lovely shot of the Yellow-rumped Warbler 🙂 And what an awesome way to spend Valentine’s day! I would always rather walk around outside than try to get into a restaurant on a popular holiday, and I bet you are the same way too! That is a great photo of the yellow-rumped guy! He really did cooperate! And congrats on the new bird for your list. Thanks! I couldn’t believe how many birds were there!